Satin Finish. 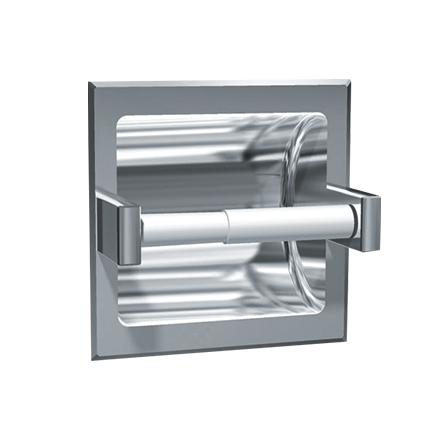 Recessed Toilet Paper Holder holds and dispenses all standard core roll tissue up to 6’’ diameter (Ø152) roll. Fabricated of stainless steel type 304 alloy 18-8. Roller is chrome plated high impact resistant ABS plastic and spring-loaded. Optional finish and mounting style must be specified as satin and wet or drywall. Specify finish and mounting by adding code suffixes to model number (i.e. 7402-SD or 7402-SW).